Home Paragliding lessons, Hang Gliding lessons, Derbyshire UK. 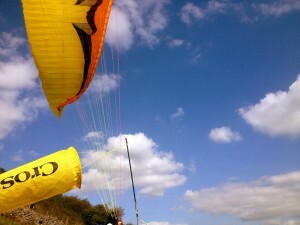 Paragliding lessons, Hang Gliding lessons, Derbyshire UK. The Derbyshire Flying Centre, established in 1987 by Stephen Hudson CFI – Senior Instructor, British Hang Gliding and Paragliding team. BHPA Merit Award. Derbyshire is the place to learn to Paraglide and Hang Glide, with the variant UK weather producing highly skilled and knowledgeable pilots. If flying is for you, then we share you enthusiasm and can take you through the BHPA pilot qualifications. To open up new horizons. “an experience beyond imagination”, the ability to fly as free as a bird. How to avoid the web spin, please go to a flying site and speak to the pilots. To make the most of Paragliding UK weather we open year round for all courses and lessons. From £125. Contact Steve on 0776 2729663 If you want to purchase a Paraglidier / Hang glider We can meet all your flight equipment needs helping you choose suitable equipment that matches your individual flying style. We offer great value, take a look at Booking info/costs. Almost anyone can learn to fly a Paraglider/Hang-glider. However, a degree of fitness and mental agility is required. These aircraft are simple to fly, but it is nonetheless still “aviation”. The pilot’s attitude to safety and airmanship is what ensures an accident free flying career. Why not give our Taster day a try like Jeff and see what you love about getting your feet off the ground. BBC. Radio. Jeff Cuttell paragliding taster day. ‘Why fly with the DFC? We have close links with the Derbyshire Soaring Club to enable a smooth transition from school to club flying. We have enabled hundreds of pilots to reach their goals over the years, you can meet them on any flyable hill. We understand that learning to fly can be expensive and scary and know that excellent training is absolutely vital! I hope you choose the DFC as the place to try this amazing three dimensional sport. Like Chris and his amazing Paragliding journey. Safety: Hang Gliding and Paragliding are extreme sports and like all adventure sports are dangerous. All BHPA schools will discuss their safety record. As a pilot you must take care of your own safety at all time. If you intend to free fly hills and mountains in the UK. You cannot learn the appropriate skills from a Tow or Foreign School. DFC. We do not spend your money on web or other advertising frivolously, we try to keep our overheads low, standards high and offer excellent value for money. For over twenty Five years we have negotiated training hills in the beautiful Peak District http://www.d-f-c.co.uk/links/peak-district-flying-sites and have access to flying sites covering all wind directions to cater for all pilot abilities. Expert flight instruction is carried out by British Hang Gliding & Paragliding Association (BHPA) qualified instructors. A small friendly team led by Steve Hudson CFI email Steve@d-f-c.co.uk whose knowledge of local sites and conditions will make your passage to pilot a success. The DFC has a proven history of successfully qualifying people to club pilot standard and sourcing them the very best flying equipment.